GOODMAN, Wis. — Bernard J. 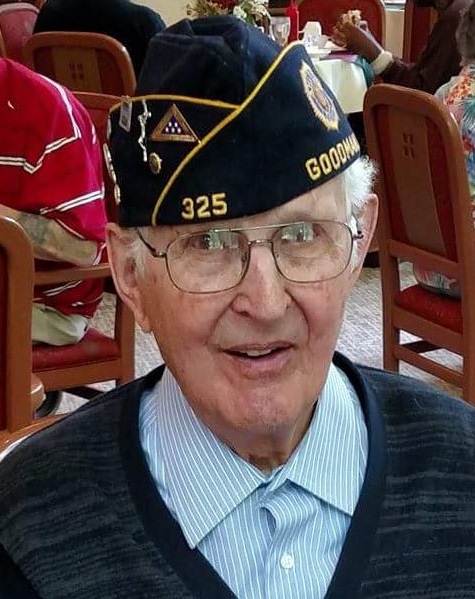 “Barney” Fatla, 97, of Goodman, died peacefully on Friday, April 12, 2019, at the Bay at Northridge Nursing Home in Manitowoc, Wis. He was born in Armstrong Creek, Wis., on Oct. 5, 1921, son of Jacob and Anna (Grandys) Fatla. Barney was united in marriage to his wife Angeline on June 24, 1944, at Joan of Arc Catholic Church. He served his country honorably in the Army. Throughout Barney’s life, he enjoyed woodworking and spending time making firewood. He always loved to have a good time and drinking his whiskey ol’fashion sweets. He was very involved with the American Legion, Post 325, where he served as Chaplain for 27 consecutive years and was Legionnaire of the year. Barney is survived by his children: Barbara (Rich) Majewski, Bernie (Sharon) Fatla, Kasha Boucher, William (Jean) Fatla, Mike (Maureen) Fatla and Tim (Lori) Fatla; grandchildren: Michelle and Scott Majewski; Nicholas (Christy) Fatla and Andrea (Clint) Huber, Luke and Eric (Hannah) Fatla, Zachary (Sasha) Fatla and Victoria Boucher; great-grandchildren: Owen, Haley, Emma, Madelyn and Summit; siblings: Jerry (Fran), Tom (Anita), Anton, Paul (Carol), Rennette (Dennis) and Bernadette. He was preceded in death by his wife, Angeline Fatla; and siblings: Casey, Al, Frank, Jeanette, Gerty, Irene, Mabel, Lucille and Alice. Mass of Christian Burial will be at 11 a.m. Wednesday, April 17 at St. Stanislaus Kostka Catholic Church in Armstrong Creek, with Father Timothy Brandt presiding. Visitation is from 10 a.m. until the time of Mass at church. Interment will be in the Glenwood Cemetery in Goodman, with full military honors provided by the American Legion, Post 325. Online condolences may be expressed at www.roubalfuneralhome.com.